When government leaders can “go green” by getting into gardening on the grounds of the White House, then maybe the rest of us, too, can go green by gearing up our gardening efforts or being good patrons of local food growers. The White House garden is a reminder of the Victory Gardens that American families grew during World War Two. In that era, victory meant defeat of Germany and Japan. In this era, victory can mean finding successful strategies to deal with the dire social, economic, and environmental challenges that confront the nation and world. 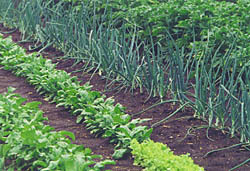 Gardening and the use of locally-grown food have many values–some that can be important in facing those challenges. The taste is exceptional; the nutrition, superb. There is more control over food safety, less waste in packaging, lower consumption of fossil fuels to transport the food, and benefits to our state’s environment, economy, and communities. The use of locally-grown foods can also counter the trend of parts of America, even our Midwestern rural areas, becoming like a colonies dependent on urban and corporate food producers. It is scary to imagine a future era when Iowa would have no farmers in the business of raising quality food to sell directly to those who live here. Another value of gardening and using locally-grown food is the potential for engaging in a slower lifestyle and deriving the intangible benefits–spiritual, emotional, neighboring, or communal–that come from connecting with the earth and/or the people who produce our food. That said, I should mention that gardening is not for everyone and that non-gardeners too can be patrons of the local foods movement. In the 1970s, I heard a man from the agricultural extension department say that having fun and success were important considerations for people who wanted to garden. He recommended that people begin with a single tomato plant next to their door. The idea was that they would pass by it often, appreciate its daily development, and be able to pluck a tomato in the peak of its ripeness without hiking to the back yard after a long day of work to tend the vines or losing the out-of-sight-out-of-mind fruit to neglect. His advice for people who wanted to put food by in large quantity–say spaghetti sauce–was to buy the produce in bulk from local farmers. 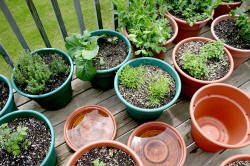 I am reminded of the container garden on the deck of my second floor Gilbert apartment. There I grew zinnias, herbs, tomatoes, cucumbers, kale, and other vegetables before moving to Ames nearly three years ago–a distance of some five miles. Now I have a huge garden and am able to grow enough cucumbers to supply a pint jar of bread and butter or dill pickles for each tables at the soup lunches my church holds four times a year and its holiday potluck dinners. But the container garden was satisfying, much more manageable, and a great learning laboratory with no weeds and no rabbits. Regardless of what is written in this column, there are people who will engage in gardening. Apparently, it’s our nation’s number-one hobby. So the bigger question is how do our towns and various organizations such as churches, betterment groups, nursing homes, retirement centers, and service clubs become more supportive of gardening and the use of locally-grown food. I propose that a town or organization could do an informal gardening inventory of its residents and/or members. The project could start slowly on an experimental scale this year. Then a year from now, the group could refine the plan and expand the effort. What members or friends have turf with good topsoil, drainage, and openness to sunshine where they would be willing to host a garden plot? It could be 2x2 feet here or 3x9 feet there. It could be in an empty space between two buildings on Main Street, on an island in a neighborhood cul-de-sac, or in a front yard. Who has gardening wisdom and a desire to be part of the project? Who suffers from the impression that he or she has a brown thumb but wants to garden? What resources such as the county office of university agricultural extension service or a local gardening group are available to lend advice? The idea would be to develop gardening circles analogous to church circles, support groups, or interest groups such as book clubs, investment clubs, and quilting bees. However, in this case, each circle would focus on a specific geographical location and the production of food. Ideally, circle members would be able to walk, bicycle, or drive their wheel chair with ease to their group’s garden plot. The plots could be in various sections of town. And perhaps there could be a small, highly visible plot next to city hall or others in central places such as at the entrance of a hospital or mall. Each group would discern its own goals and operating guidelines. The operation may not be 100 percent bliss; but in this not entirely perfect process may lie an avenue to the deep bond that happens when people work together. A circle would decide if it was going to have a “rugged individualism” model with each person having a piece of the turf to grow what he or she wants or if it would opt for collaborative decision-making. There would be decisions about what to grow, to grow organically or not, to use city water or rain water, or to start from seed or transplants. The circle would decide upon its style of farming. Would there be meticulous row crop gardening or messy permaculture beds, advanced efforts put into layered beds that reduce the need for weeding or Herculean efforts to pull weeds as the season progresses? Oh yes, there would be decisions about rabbits–whether to swear at them and threaten to get out the pellet gun or simply greet and let them be (but certainly to erect some fences around the vegetable patches). There will be the rub of how to share the input costs and resolve conflicts as well as dealing with varying work ethics, jobs and vacation schedules, standards for cleaning the shovels, rakes and other tools. Will there be one queen bee and several worker bees? Will someone who can’t physically engage in gardening be a welcome member of the circle and benefit from being in a garden setting and connecting with other gardeners? Maybe that person could read the instructions from the back of the seed packets to the other gardeners in the group or serve the lemonade and iced tea. How will the circle share its produce: among members, with friends? As part of acongregational or community dinner? Set aside for a program such as the Plant-a-Row-for-the-Hungry project, used in preparing meals for a homeless shelter, brought to a sharing table at the community center on a weekday or the church social hall on a Sunday morning, delivered to the cook at a care center, or sold to a make a dime or two? And the big question will be: who is responsible for the bounty of unused zucchini! The new garden at the White House is more than a source of fresh vegetables for Barack, Michelle, Malia, Sasha, Michelle’s mother, and their guests. It is an iconic project. The Victory Gardens of the 1940s provided more than simply food for ordinary families. Those gardens, too, were iconic–practical but a way to be grounded with limited resources in the face of great challenges. The success of the proposed gardening circles could be not merely a matter of the food and deepened friendships that grow from the garden plots and the care of them. Its value will also lie in the unexpected, intangible benefits–be they spiritual, emotional, social, or political–that emerge from such engagement and help fortify the members to face the extraordinary challenges of this era. And just maybe, the efforts of the members as part of a larger network will be symbolic with a ripple effect that extends beyond the specific congregation, organization, or community that provides the oversight for the project.